In my last article, I gushed about Bedlam Reveler just a couple days after he was spoiled. It’s been a week since then, and I’ve had plenty of time to improve my Temur Traverse build with the walking Treasure Cruise. Today, we’ll talk achieving delirium in Modern and building around Bedlam Reveler, and continue to explore Temur Traverse. Testing with delirium shells, all of which include Traverse the Ulvenwald, has led me to a few hard conclusions about the mechanic. For one, enabling delirium isn’t as laughably easy as I had initially hoped. Instants, sorceries, and lands find their way into our graveyard painlessly, but things can get hairy when it comes to the fourth card type. Delirium still turns on at an acceptable speed with the help of specific enablers, which either help mill the fourth type or count themselves. 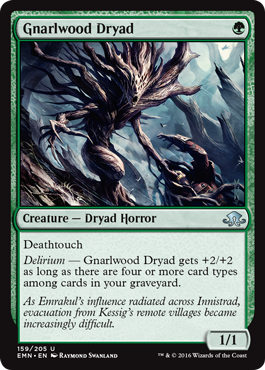 Second: in my opinion, which is based on testing but not yet on tournament results, the payoff of running Traverse the Ulvenwald is worth playing sub-par cards that help with delirium. These enablers also improve Tarmogoyf, a delirium-deck staple we already have plenty of incentive to build around. Of our options, Modern players have three prime choices to stock the graveyard full of card types. A zero-mana, turn-delayed cantrip doesn’t cut it in constructed formats, which is why Bauble never saw play until recently. But a zero-mana, turn-delayed Opt just might. In a deck full of fetchlands, Bauble all but promises to scry 1 early on—players can peek at their top card, play a fetchland and pass the turn to draw it, or crack right away to try hitting something else. It remains a miserable topdeck with no fetchlands in play. Still, Bauble’s scrying potential is really icing on the cake. We have more tangible reasons to run the cantrip. Once one of Patrick Chapin’s cuter pet cards, Bauble has come a long way since its Esper Delve origins, recently becoming a staple in Death’s Shadow Zoo. In combination with that deck’s many fetchlands, Bauble often provides a scry. It also stocks the graveyard for Become Immense and Tarmogoyf and triggers prowess on Monastery Swiftspear. Its many possible roles make Bauble an easy include in this kind of deck. Combining with Thought Scour and Path to Exile to fateseal opponents. Flipping for zero with Dark Confidant. Hiding cards from hand-emptying effects like those of Liliana of the Veil, Day’s Undoing, and Bedlam Reveler. If a delirium deck hits more than one of these checklist points, Bauble may prove a fitting include. But the deck in question also mustn’t play too many cards that interfere with the artifact. For example, Bauble decks probably shouldn’t run Stony Silence or Thalia, Guardian of Thraben in their 75. Similarly, I’ve been wary of including it alongside Bedlam Reveler due to the Devil’s preference for instant- and sorcery-type cantrips. My recent iterations of delirium decks run both Traverse the Ulvenwald and Bedlam Reveler, the latter usually as a two-of. In Modern, two damage can be as good as three, and paying one mana for that damage yields the best card in the format. Tarfire often plays like extra copies of Lightning Bolt as a result. Add to that its unique pairing of relevance, tribal type, and status as an instant or sorcery, and it becomes an obvious include in Traverse/Reveler decks. Instant type gives Tarfire a distinct edge over Seal of Fire as a delirium enabler in a Reveler-based deck. The spell can also surprise-grow Tarmogoyf in response to Lightning Bolt, Anger of the Gods, Dismember, or during combat. It can also make Goyf 4/5 to enable ferocious for an unexpected Stubborn Denial or Feed the Clan. Scour enables delirium by hopefully dumping a needed card type into the graveyard. Since it bins randomly, there’s no guarantee it will hit the right type. But in decks short on Boltable creatures, Thought Scour might be the best way to get a creature into the graveyard. Modern’s Bolt-less interactive decks play Path to Exile, which sends creatures to exile. Its uninteractive decks, most of which lack Bolt and Path, struggle when it comes to killing even opposing x/1s. We might want to search up Magus of the Moon or Izzet Staticaster against these decks, so turning on delirium early is key. In a deck that can’t easily fit Bauble and understandably doesn’t want to jam 4 Tarfire, Scour provides an attractive way to get that fourth type. Tarmogoyf might cap out at 8/9 on paper, but realistically, we can spend entire games trying to build him up to that final form and still leave him with an appetite. Delirium, like Bedlam Reveler, caps much earlier and gives players nothing for setting up “overkill;” having eight card types in the graveyard won’t make delirium any better than having four. For this reason, a full set of Scours can sometimes feel like overkill. Bedlam Reveler (previously mistranslated as Chaos Reveler) seems poised to take interactive, spell-based aggro decks to new heights in this format, and I’ve loved him so far in delirium builds. Unlike Treasure Cruise, Reveler gives players a way to draw cards without touching the graveyard, allowing Traverse and Tarmogoyf to retain their full value. Reveler shines against midrange decks by allowing us to refill on cards after an attrition battle. For this plan, running two Revelers is ideal; only casting one might not be enough to overcome sticky enemy boards like Goyf + Liliana. Resolving Reveler and then Cruising into Traverse or Snapcaster Mage, or a cantrip that can find one of those cards, ensures another Devil follows on its heels and can safely put the game away against most boards attrition decks come up with. I’ve also liked Reveler when I take on the midrange role. Against uber-fast strategies like Infect, I’ll cut one Reveler, but keep the other as a searchable way to stabilize after trading pieces one-for-one. The Horror’s 3/4 stats also slow ground-based aggro decks way down, and prowess can blow attackers out in combat in tandem with a Thought Scour or Lightning Bolt. The other day I got to Bolt Flickerwisp and block Thought-Knot Seer with my swollen fire dweller. No card is perfect, and Reveler is no exception, sometimes clunking out in hand. At times, we’d love to play out a big body with Stubborn Denial backup. But casting Reveler forces us to bin the Denial and anything else we might want to spend first. One solution to this problem is to run less land and permission, ensuring we can empty our hands early. But running fewer lands means we might struggle to cast the creatures in our hand instead of the spells. Another possibility is to largely abandon other value engines and instead max out on Reveler. I tried this route for my UR Delver build from last week, and I think it can really work in that kind of shell. This weekend, I plan to test it in a more interactive build with Tarmogoyf. A final point on Reveler: I did some brief testing with the card in the Monkey Grow sideboard to help against midrange and it showed promise, especially when it showed up at the right time. But savvy BGx players can Thoughtseize the Reveler early or take it away via Kolaghan’s Command and Liliana of the Veil later, making a Snap-Traverse package invaluable in ensuring we have the Devil when we need it. In a Temur Traverse shell, though, Reveler is performing very well for me. I would be very surprised if other Modern decks didn’t adopt it to some degree of success. A couple new cards might stand out to readers following this deck’s development. Vapor Snag: Gives us more of an all-around Game 1 by allowing us to assume a tempo role more easily. Snag also shines against midrange strategies. Bouncing Goyf in response to a kill spell might not seem so exciting, but bouncing Snapcaster or Reveler is the stone nuts. Seal of Primordium: Two damage to the face isn’t a great add-on for a deck that usually wins via attrition. I’m trying Seal in place of Destructive Revelry as an answer to annoying enchantments like Rest in Peace. Seal still synergizes with Reveler by escaping our hand even without a target on the field, and it grows Goyf to boot. But not working with Snapcaster Mage definitely hurts. The jury’s still out on this one. I had a chance to try both Gnarlwood Dryad and Delver of Secrets in this deck, and I rarely liked either of them. Often, casting a one-drop felt underwhelming, and it never meshed with the Traverse plan unless it immediately ate a Bolt. I always wished they would, leading me to believe more delirium enablers or early interaction should take their place. One major argument in favor of one-drop threats was their relevance against Tron. But some reps against that deck led me to believe that a “bigger” tempo plan à la Jund might be preferable for us. Jund famously has a terrible Tron matchup, but I think it gets much better once Mana Leak, Stubborn Denial, and Vapor Snag get added to the mix. A pair of Molten Rains in the sideboard, coupled with our artifact hate and counterspells, seemed to remedy the matchup. It’s still not our best, but Goyf into Moon into Huntmaster or disruption is as relevant as ever against big mana decks. The sideboard also got a makeover. Glen Elendra, Spellskite, Dark-Dwellers, Staticaster, and Stormbreath are my bullets of choice, leaving Reclamation Sage and Keranos, God of Storms at home. Both cards had the same problem: when I could traverse, I usually wanted to get something else, even with an enchantment on the table. Against a tapped-out Jeskai deck, Keranos looks attractive on paper, but Stormbreath closes out games much faster in that situation. And it’s not like Sage blows up Rest in Peace on command, since we can’t Traverse for her with the enchantment on the table. The five bullets I’ve kept all earn their spots handily. Glen Elendra Archmage: A one-card “Wall of Negates” against spell-based interactive decks and linear combo alike. If we can make it to five mana, Glen Elendra can ruin a game for combo. Scapeshift, Ad Nauseam, Through the Breach, and Jeskai Nahiri all hate this card. Even Jund has trouble removing the faerie profitably thanks to persist. Spellskite: Generally hailed as one of Modern’s best sideboard cards, Spellskite might be a little overrated. The decks it hoses pack answers to it either in the main or the side (Viridian Corrupter, Nature’s Claim), and Lightning Bolt decks can still win through one. Decks still have to be holding the right answer to deal with Skite immediately, and the time it buys this deck justifies its inclusion in the sideboard as a serachable hoser, despite its fragility. 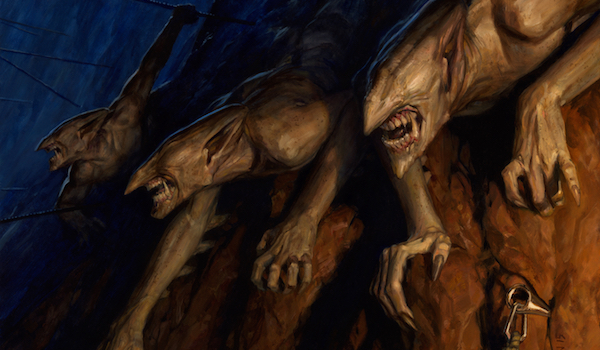 Goblin Dark-Dwellers: A functional fifth Snapcaster in grindy matchups, whether it’s our opponent or us who wants to take a midrange role. Dwellers opens up tons of value plays, like Traverse into Dwellers flashing back Traverse into Huntmaster for next turn. He also synergizes with sideboard hate cards like Molten Rain, Feed the Clan, and Anger of the Gods. Izzet Staticaster: Great at slowing down Birds/Hierarch decks so we can interact at our own speed, and shooting dorks simplifies locking opponents out with Blood Moon. Staticaster also randomly destroys certain matchups, like Infect and sometimes Affinity. I even like Staticaster in blue mirrors as a way to two-for-one by shooting a Mage or Clique before letting him die to an opponent’s precious removal spell. Stormbreath Dragon: It’s hilarious how many decks can’t beat this card. Abzan Company, Jeskai, UW, and Abzan—barring a lucky Maelstrom Pulse or Slaughter Pact—are just dead in the water to Stormbreath Dragon, who notably can’t be chumped by Lingering Souls. Blood Baron of Vizkopa has shown us that resisting Bolt, Path, and Decay doesn’t make a five-drop Modern-playable. But Stormbreath also resists Tarmogoyf, and haste can make him feel more like a four-drop. Anger of the Gods and Molten Rain also join the sideboard as highly efficient answers to popular Modern strategies. Anger answers a board full of dorks and Ouphes better than anything, and Rain comes in not just for Tron, but against any midrange deck. Given Magus of the Moon‘s searchability, it can also act as Stone Rain in a deck that regularly makes double red to embarrass opponents who fetch around Blood Moon. Vendilion Clique, Spell Snare, and the two Scours occupy slots I’ve been messing with constantly. So far I’ve tried Remand, a second Huntmaster, Sleight of Hand, mainboard Spellskite, a third Tarfire, and another Vapor Snag in those slots. They’re still up in the air, but here are my thoughts on the options so far. Vendilion Clique: A pre-flipped Delver with utility against Tron, BGx, and any deck that needs to land one of a few cards that we’re keeping them off (i.e. Infect or Bogles for creatures). My main beefs with Clique are how fast it dies to Bolt, something untrue of our other creatures besides Snapcaster Mage, and its fussiness under a Blood Moon effect. Spell Snare: Bonkers in plenty of matchups, but I wouldn’t include multiple Snares in this deck because of Bedlam Reveler. Snare gets caught in hand more than any other counterspell and is flat dead in certain matchups. Remand, Sleight of Hand: These cards prove problematic because they don’t help with delirium. I initially tried them once I became tired of having 20 cards in my graveyard all game and drawing Scours anyway, but I now think the self-milling cantrip is necessary in some number. Huntmaster of the Fells, Spellskite: In the matchups where these creatures have little use, drawing them naturally is very frustrating. Huntmaster has a lot of game against the Modern field, so this scenario mostly happened with Spellskite, who will probably never return to the mainboard. Tarfire, Vapor Snag: I sometimes clogged on these kinds of effects. In matchups where Bolt is lackluster, Tarfire is downright terrible. And against creature-light decks like Jeskai Nahiri, while Snag sometimes saves one of our threats, it stinks to have to throw it away to a Bedlam Reveler. In his article from this week, Sheridan expressed excitement about Bedlam Reveler in Delver, and I share his enthusiasm. I’ve just been having so much fun Traversing for the guy I haven’t sleeved up my beloved insects. To fellow Delverers: rest assured I’ll experiment with Reveler in my preferred archetype soon. But as Modern has taught us, time is a precious thing, and we only have so much of it. Have any of you been experimenting with Reveler? With Traverse the Ulvenwald? Let me know in the comments and I’ll see you next week. Have you given much thought to running seal of fire, and mishra’s baubles as 1-ofs in some of the ‘delerium enabler’ slots? My thinking is that you can already assume hitting 3/4 delerium, so you only need the 4th type except you get payed with extra big goyfs (compared to what you would be able to get mono lands/instants/sorceries/creatures). I try to add 1 of each in my traverse builds to increase the odds of hitting early delirium. I have, and explained their absence in the article. I’ve built and been testing a Temur Traverse deck also and have found Faithless Looting to be an excellent Delirium enabler, quite often allowing me to have Delirium from turn one onwards if my hand justifies it. I was wondering if you’ve tested with Looting at all? Also, as a little sidenote, I’ve tried Autumnal Gloom as both a delirium enabler and pay-off card and so far I’ve been really happy with the result. Given any thought to Sultai traverse? Losing bolt is brutal but you get decay and discard if you want it, but mostly bitterblossom is amazing for delirium and goyf. Also darkslick shores saves a couple life points vs aggro. Losing Bolt is too brutal. My beef with Bitterblossom is that it’s mostly just good in that kind of shell when it reliably goes to the graveyard, which it doesn’t. Looting is sub-optimal and forces us into red, meaning we’ll take too much from our manabase to enjoy playing Blossom at all; Lili won’t discard it until turn three, and that’s assuming we don’t want to immediately -2 her; Scouring it away is a total crapshoot. Relying on opponents to counter or remove it isn’t a great plan because if they have the choice, they’ll always pick the one best for them. I feel that often, that will be letting Blossom resolve. The card Bitterblossom is not nearly as strong as Wizards thought when they banned it, and if it resolves, it won’t necessarily win the game. Something like Pyroclasm resets the Fairie count, and Bolts to the face let opponents turn the corner on us very easily. Maybe if Blossom was playable on its own I could see including it in these decks, but as is, I can’t. In my previous article, I lamented that it was tough to include Disrupting Shoal in a deck with Grim Flayer, Traverse, and enablers like Bauble. Bitterblossom just adds to that problem. As a result, we need to play Bolt to have enough early interaction to stand a chance in Modern. But we’d become way too suicidal with Bitterblossom in the deck, too. That’s why I haven’t tried fitting Traverse into Sultai Faeries. What do you think of running architects of thought as the blue cantrip rather than thought scour? It guarantees putting creature and artifact into your yard, two harder to get types.